Tongariro National Park is without a doubt the Outdoor and Winter Sports Adventure Playground of New Zealand’s North Island and at The Crossing Backpackers, you’ll find yourself in the heart of it all. Whakapapa, on the western slopes of mighty Mount Ruapehu, is New Zealand’s largest developed ski field. With 550 hectares, Whakapapa provides excellent skiing and boarding for all levels! There are no less than 30 groomed trails and you will find a massive variety of off-piste areas for the more advanced skiers and boarders. Even if skiing or boarding is not your thing, or if you feel like some other snow play, there is an awesome tobogganing and tubing area at Whakapapa, offering loads of sliding amusement! Another awesome ski area near The Crossing Backpackers is Turoa, offering an exciting snow experience for all the family with an excellent variety of terrain to suit all levels. 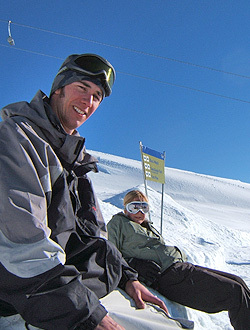 Turoa is the highest ski area in New Zealand and measures about 500 hectares of patrolled terrain. There are 3 main off-piste areas that strong skiers and riders will surely enjoy. And if you want to turn your legs into jelly, there is a run that is 4kms long! Turoa also has Australasia’s longest vertical… at 722m! Due to our central location, you can easily enjoy both ski fields in one day while staying at The Crossing Backpackers. Whakapapa is 20 mins drive from the lodge and Turoa can be found within 40min. So if you are here to enjoy your winter sports, there simply is no better place to stay! Providing accommodation for activities in Tongariro National Park, Mt Ruapehu, Whakapapa and Ohakune, Ski and Board New Zealands largest ski feilds.